So much for the truce, Ella Mai and Jacquees put into place following the "Trip" remix misunderstanding. Two nights ago, Tory brought the King of R&B as a surprise guest at his London concert, where he sang his version of Ella Mai's "Trip," the same song he consented to pull off his SoundCloud following DJ Mustard's legal flex. 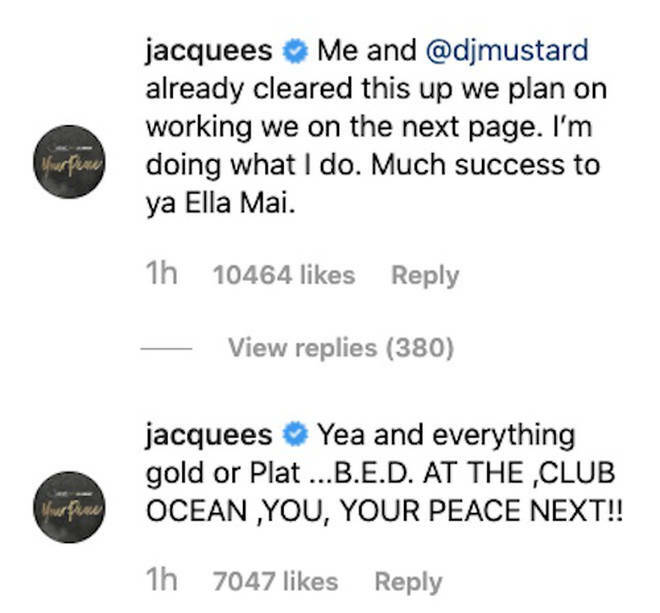 After taking notice of Jacquees' live performance on the song, Ella Mai jumped on Twitterj to comment on the situation several months after the fact. "I’d be so embarrassed if someone brung me on stage and the only thing I could sing was someone else's song because nobody knew my actual music. poor thing," she tweeted without @ing Jacquees by name. The response all but re-ignited what was thought to be a "deaded" feud. Before Jacquees could even comment himself, Tory Lanez lined himself up in his defense by insisting that he only sang "Trip" in response to the raucous demands of the 30,000 in attendance, akin to the general fan making a request. As you can see (above) chose to take the high road before pointing to the success he's garnered outside of the "Trip" remix, and not thanks to it.